The present invention is directed to a process for preparing a carbohydrate polymer which comprises polymerizing a sugar at a temperature below the point of substantial decomposition thereof and under reduced pressure in the presence of a catalytic effective amount of an organic acid selected from the group consisting of a monocarboxylic acid, a lactone of a monocarboxylic acid and arylol, while removing water formed during said polymerization, said organic acid being non-volatile and having only one acidic functionality and having no amino groups thereon. It is also directed to the product produced therefrom. 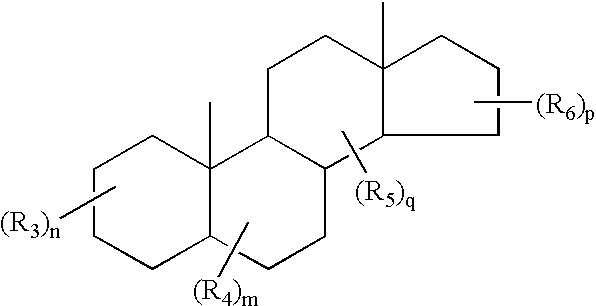 or a steroid wherein R 7 is lower alkyl or aryl or lower aryl alkyl; R8 is lower alkyl or aryl or lower aryl alkyl and n1 is 0-10 and more preferably 0 or 1 and most preferably 0.
each R 3, R4, R5 and R6 are independently, hydrogen or one of the substituents defined hereinabove on R. It is preferred that each R3, R4, R5 and R6 are independently hydrogen, hydroxy, lower alkoxy, lower alkyl, oxo, carboxy, lower alkyl substituted by carboxy, lower alkoxy substituted by carboxy, lower carbalkoxy wherein one and only one of R3, R4, R5 or R6 contains a carboxy group. 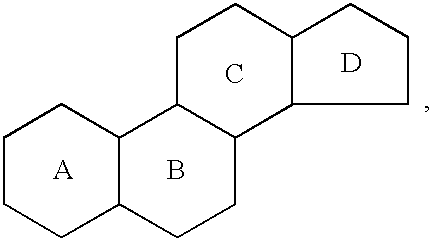 It is to be noted that n, m, q and p indicate the number of substituents on each ring. For example, when n is 1, the A ring contains 1 R 3 substituent and the remaining groups on the A ring are hydrogen; when n is 2, the A ring contains 2 R3 substituents, which R3 substituents may be the same or different. However, when n is 0, then the A ring is unsubstituted. 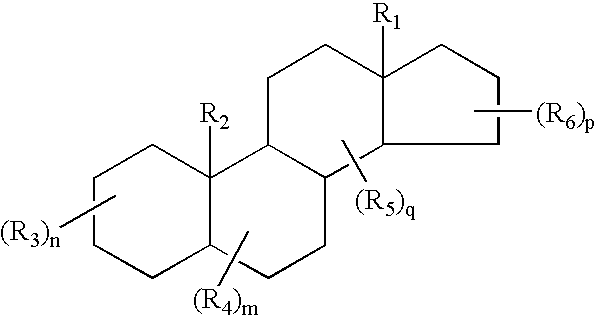 The same is true with respect to (R4)m, (R5)q and (R6)p. At least one of the rings is substituted and contains a carboxy group, either substituted on the ring or a substituent which is itself substituted by carboxy. It is preferred that the carboxy group is substituted on the ring or on a lower alkyl group which is substituted on one of the rings. It is more preferred that the carboxy group is substituted on an alkyl group which is substituted on one of the rings, and it is even more preferred that the carboxy group is at the terminal end of the alkyl group. It is most preferred that the carboxy group is substituted on an alkyl group which is substituted on the D ring. 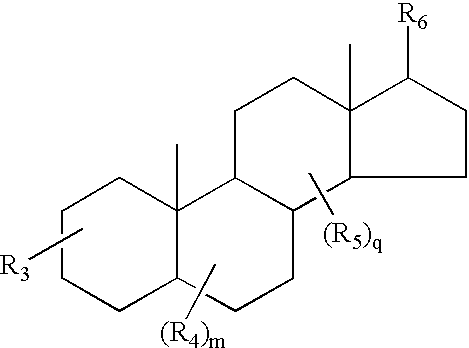 wherein R 6 is a lower alkyl group containing a carboxy, and R1, R2, R3, R4, R5, n, m and q are as defined hereinabove. The preferred R 1 is CH3. The preferred R 2 is CH3. It is preferred that R 3 is OH. R 4, when present is preferably OH. R 3, R4, R5 and R6 are as defined hereinabove. The preferred steroidal acids are cholic acid, lithocholic acid, chenodeoxycholic acid and deoxycholic acid. wherein R 7, R8 and n1 are as defined hereinabove. Preferably, n1 is 0 or 1. If a keto acid or hydroxy acid is the carboxylic acid, it is preferred that it is a α-hydroxy acid or α-keto acid. Preferred keto and hydroxy acids are pyruvic acid, lactic acid and glycolic acid. The anhydrous melt polymerization may be carried out at a pressure below atmospheric pressure. The preferred pressures do not exceed about 300 mm Hg, and range preferably, from about 10 −5 to 100-300 mm Hg, which can be obtained by the use of a vacuum pump, a steam jet ejector, an aspirator or by other means commonly used in the art. The vacuum is required in order to exclude air from the polymerization and to remove the water of hydration and the water liberated in the polymerization reaction. Air should be excluded from the environment of the polymerizing mixture in order to minimize decomposition and discoloration of the polyglucoses or polymaltoses formed in the polymerization. A fine stream of nitrogen has also been found to be useful with this invention as a method for excluding air and removing the waters of hydration and polymerization which are formed. Where the nitrogen purge is used, the vacuum requirements are lessened but pressures of 100-300 mm Hg or less are still preferred. 1. A process for preparing a carbohydrate polymer which comprises polymerizing a sugar selected from the group consisting of a monosaccharide, dissacharide, oligosaccharide and hydrolysate of a carbohydrate polymer at a temperature below the point of substantial decomposition of said sugar and under reduced pressure and under conditions effective for polymerization in the presence of a catalytic effective amount of an organic acid thereof while removing water formed during said polymerization, said organic acid being a monocarboxylic acid or lactone thereof or arylol. 2. The process according to claim 1 wherein said organic acid is present in a range from 0.01 to about 25 mol % relative to the sugar. 3. The process according to claim 2 wherein said organic acid is present in amounts ranging from about 0.01 to about 1 mol %. 4. The process according to claim 1 wherein the organic acid is an arylol. 5. The process according to claim 4 wherein the organic acid is a phenol, alkyl substituted phenol or alkenyl substituted phenol, wherein the alkyl and alkenyl groups each independently contain 1-6 carbon atoms. 6. The process according to claim 1 wherein the organic acid is a monocarboxylic acid. 7. The process according to claim 1 wherein the organic acid is a steroid monocarboxylic acid, sugar monocarboxylic acid, aryl monocarboxylic acid, aralkyl monocarboxylic acid, aliphatic monocarboxylic acid, cycloaliphatic monocarboxylic acid, or heterocyclic monocarboxylic acid or heterocyclic alkyl monocarboxylic acid or combination thereof or a lactone of the organic acid. 8. The process according to claim 1 wherein the organic acid is aldouronic acid or aldonic acid. n and q are independently 0-2, with the proviso that only one of R3, R4, R5 or R6 contains a carboxy group. 10. 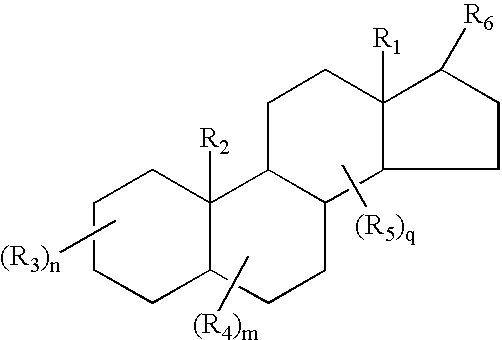 The process according to claim 9 wherein R6 is an alkyl group substituted by carboxy, and p is 1. 12. The process according to claim 1 wherein the organic acid is a monocarboxylic fatty acid. 13. The process according to claim 1 wherein the organic acid has the formula RCOOH wherein R is alkyl containing 1-24 carbon atoms or alkenyl containing 2-24 carbon atoms and 1, 2, 3 or 4 carbon-carbon double bonds, cycloaliphatic containing 3-18 ring carbon atoms, aryl containing 6-18 ring carbon atoms, arylalkyl containing 6-18 ring carbon atoms and 1-6 carbon atoms bridging the aryl group and the COOH, heterocyclic, heterocyclic alkyl, heteroaromatic or heteroaromatic alkyl, wherein heterocyclic contains 3-18 ring atoms and at least 1 ring and at most 4 ring heteroatoms, and the remainder are carbon ring atoms, heteroaromatic contains 5-18 ring atoms and at least 1 and at most 4 ring heteroatoms, and the remainder are carbon ring atoms wherein the heteroatom O or S; heterocylic alkyl is an alkyl group containing 1-6 carbon atoms bridging a heterocyclic group and the COOH, and heteroaromatic alkyl is an alkyl group containing 1-6 carbon atoms bridging the heteroaromatic group and the COOH group. 14. The process according to claim 1 wherein the organic acid is benzoic acid, salicylic acid or acetyl salicylic acid. 15. The process according to claim 1 wherein the organic acid is a lactone of a monocarboxylic acid. 16. The process according to claim 15 wherein the lactone is glucono delta lactone. 17. The process according to claim 1 wherein from about 5 to 20% by weight of a food acceptable polyol is added prior to or during said polymerization. 18. The process according to claim 17 wherein the polyol is selected from the group consisting of sorbitol, glycerol, erythritol, xylitol, mannitol and galactitol. 19. The process according to claim 18 wherein the polyol is sorbitol. 20. The process according to claim 1 wherein polymerization occurs at a pressure of less than about 300 mm Hg. 21. The process according to claim 1 wherein the product is polydextrose. 22. The process according to claim 1 wherein the organic acid is glycolic acid, pyruvic acid or lactic acid. 23. The process according to claim 1 wherein the organic acid is a monocarboxylic acid or lactone thereof. 24. The process according to claim 19 wherein the product is polydextrose. 25. The process according to claim 1 wherein the product is polydextrose or polymaltose and the process comprises polycondensing a sugar selected from the group consisting of D-glucose and maltose at a temperature ranging from about 140° C. to about 295° C. and at reduced pressure in the presence of a catalytic effective amount of a said organic acid, while removing water formed during said polymerization organic acid being. 26. The process according to claim 25 wherein the process comprises melting the sugar at a temperature ranging from about 140° C. to about 295° C. and at reduced pressure in the presence of a catalytic effective amount of an organic acid, while removing water formed during said polymerization. 27. The process according to claim 25 wherein said organic acid is present in about 0.01 to about 25 mol % relevant to the sugar. 28. The process according to claim 27 wherein said organic acid is present in amounts ranging from about 0.01 mol % to about 1 mol %. 29. The process according to claim 25 wherein the organic acid is a steroid monocarboxylic acid, sugar monocarboxylic acid, aryl monocarboxylic acid, aralkyl monocarboxylic acid, aliphatic monocarboxylic acid, cycloaliphatic monocarboxylic acid, or heterocyclic monocarboxylic acid or heterocyclic alkyl monocarboxylic acid. 30. The process according to claim 25 wherein the organic acid is an arylol. 31. The process according to claim 30 wherein the organic acid is a phenol, alkyl substituted phenol or alkenyl substituted phenol, wherein the alkyl and alkenyl groups contain 1-6 carbon atoms. 32. The process according to claim 25 wherein the organic acid is a monocarboxylic acid or a lactone thereof. 33. The process according to claim 32 wherein the organic acid is a monocarboxylic acid. 34. The process according to claim 32 wherein the organic acid is a lactone of a monocarboxylic acid. 35. The process according to claim 25 wherein the organic acid is a sugar monocarboxylic acid. 36. The process according to claim 35 wherein the monocarboxylic acid is aldouronic acid or aldonic acid. 38. The process according to claim 25 wherein the monocarboxylic acid is a fatty monocarboxylic acid. 39. The process according to claim 25 wherein the monocarboxylic acid has the formula RCOOH wherein R is alkyl containing 1-24 carbon atoms or alkenyl containing 2-24 carbon atoms and 1, 2, 3 or 4 carbon-carbon double bonds, cycloaliphatic containing 3-18 ring carbon atoms, aryl containing 6-18 ring carbon atoms, arylalkyl containing 6-18 ring carbon atoms and 1-6 carbon atoms bridging the aryl group and the COOH, heterocyclic, heterocyclic alkyl, heteroaromatic or heteroaromatic alkyl, wherein heterocyclic contains 3-18 ring atoms and at least 1 ring and at most 4 ring heteroatoms, and the remainder are carbon ring atoms; heteroaromatic contains 5-18 ring atoms and at least 1 and at most 4 ring heteroatoms, and the remainder are carbon ring atoms wherein the heteroatom is O, S or N; heterocylic alkyl is an alkyl group containing 1-6 carbon atoms bridging a heterocyclic group and the COOH; and heteroaromatic alkyl is an alkyl group containing 1-6 carbon atoms bridging the heteroaromatic group and the COOH group. 40. The process according to claim 25 wherein the organic acid is benzoic acid, salicylic acid or acetyl salicylic acid. 41. 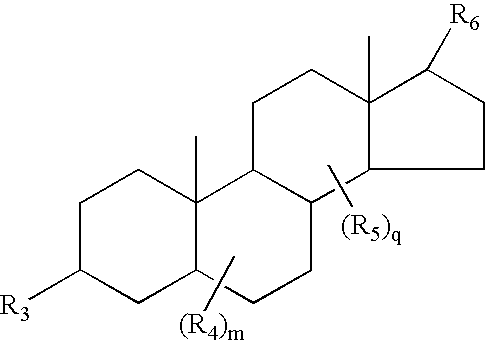 The process according to claim 25 wherein a polyol is additionally present. 42. The process according to claim 25 wherein the organic acid is a lactone of a sugar monocarboxylic acid. 43. The process according to claim 42 wherein the lactone is glucono delta lactone. 44. The process according to claim 25 wherein from about 5 to 20% by weight of a food acceptable polyol is added prior to or during said polymerization. 45. The process according to claim 44 wherein the polyol is selected from the group consisting of sorbitol, glycerol, erythritol, xylitol, mannitol and galactitol. 46. The process according to claim 45 wherein the polyol is sorbitol. 47. The process according to claim 25 wherein the polymerization occurs at a pressure of less than about 300 mm Hg. 48. The process according to claim 25 wherein the organic acid is an α-keto monocarboxylic acid or an α-hydroxy monocarboxylic acid. 49. The process according to claim 48 wherein the monocarboxylic acid is glycolic acid, pyruvic acid or lactic acid. 50. The process according to claim 1 wherein the carbohydrate polymer is subjected to purification. 51. The process according to claim 50 wherein purification comprises neutralizing the acid associated therewith. 52. The process according to claim 51 wherein neutralizing comprises contacting the carbohydrate polymer with base. 53. The process according to claim 51 wherein neutralizing comprises dialyzing the carbohydrate polymer. 54. The process according to claim 51 wherein neutralizing comprises making a concentrated solution of the carbohydrate polymer and passing said concentrated solution through an adsorbent resin. 55. The process according to claim 54 wherein the adsorbent resin is an ion exchange resin. 56. The process according to claim 50 wherein the carbohydrate polymer is contacted with molecular sieves. 57. The process according to claim 1 wherein the carbohydrate polymer is hydrogenated. 58. The process according to claim 57 wherein the carbohydrate polymer is subjected to purification and hydrogenation. 59. The process according to claim 58 wherein purification comprises neutralizing the acid associated with the carbohydrate polymer. 60. The process according to claim 59 wherein neutralizing comprises passing the carbohydrate polymer or the hydrogenated carbohydrate polymer through an ion-exchange resin. 61. The process according to claim 25 wherein the product is subjected to purification. 62. The process according to claim 61 wherein the purification comprises neutralizing the acid associated with the product. 63. The process according to claim 62 wherein neutralizing comprises contacting the product with base. 64. The process according to claim 62 wherein neutralizing comprises dialyzing the product. 65. The process according to claim 62 wherein neutralization comprises making a concentrated solution of the product and passing said concentrated solution through an adsorbent resin. 66. The process according to claim 65 wherein the adsorbent resin is an ion exchange resin. 67. The process according to claim 61 wherein the product is contacted with molecular sieves. 68. The process according to claim 25 wherein the product is hydrogenated. 69. The process according to claim 68 wherein the product is subjected to purification and hydrogenation. 70. The process according to claim 69 wherein purification comprises neutralizing the acid associated with the product or hydrogenated product. 71. The process according to claim 70 wherein neutralizing comprises making a concentrated solution of the product or hydrogenated product and passing the concentrated solution through an ion-exchange resin. 72. The product of claim 1. 73. The product of claim 25. 74. The product of claim 50. 75. A carbohydrate polymer associated with a monocarboxylic acid or lactone thereof. 76. 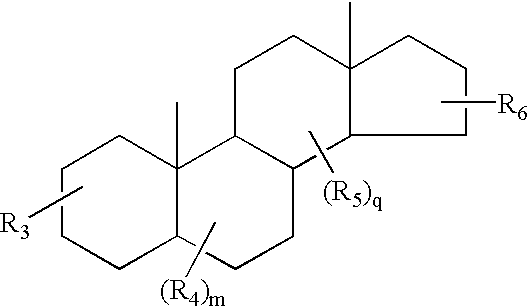 The carbohydrate polymer of claim 75 which is further associated with a polyol. 77. The carbohydrate polymer according to claim 76 wherein the polyol is sorbitol. 78. A substantially purified product of any one of claims 75-77. 79. The carbohydrate polymer according to claim 75 or 76 which is purified by contacting the same with a base in sufficient quantity to substantially neutralize the acid associated therewith. 80. The carbohydrate polymer according to claim 75 or 76 which is passed through an adsorbent resin. 81. The carbohydrate polymer according to claim 80 wherein the adsorbent resin is an ion exchange resin. 82. The carbohydrate polymer according to claim 75 or 76 which is contacted with molecular sieve. 83. The carbohydrate polymer according to claim 82 which is subjected to purification. 84. The carbohydrate polymer according to claim 83 wherein the purification comprises neutralizing the acid associated therewith. 85. The carbohydrate polymer according to claim 84 wherein neutralizing comprises making a concentrated solution of the carbohydrate polymer and passing the concentrated solution through an ion exchange resin. 86. The carbohydrate polymer according to any one of claims 75-77 which is hydrogenated. 87. The carbohydrate polymer according to any one of claims 75-77 wherein the carbohydrate polymer is polydextrose or hydrogenated polydextrose. (c) administering the foodstuff or feed of (b) to said animal. 89. The process according to claim 88 wherein the animal is a human. (a) polymerizing a sugar selected from the group consisting of a monosaccharide, disaccharide, oligosaccharide and hydrolysate of a carbohydrate polymer at a temperature below the point of substantial decomposition of said sugar and under reduced pressure and under polymerization effective conditions in the presence of a catalytic effective amount of an edible organic acid thereof while removing water formed during said polymerization, said organic acid being non-volatile, wherein said organic acid is a monocarboxylic acid or lactone thereof or arylol. (b) adding the product of (a) to foodstuff or feed. R7 and R8 are independently lower alkyl, aryl or lower arylalkyl and n1 is 0 or 1. 93. The process according to claim 92 wherein n1 is 0. 95. The process according to claim 94 wherein n1 is 0. NL8902243A (en) * 1989-09-07 1991-04-02 Suiker Unie Low-calorie polydextrose derivatives.